The National Marine Fisheries Service is asking for at least 15 months to assess the impact of their Steller sea lion protection measures. Last month, a federal judge determined that the agency had violated the National Environmental Policy Act by failing to produce an environmental impact statement before shutting down two commercial fisheries in an effort to stop the decline of an endangered stock of sea lions. While Judge Timothy Burgess generally favored NFMS in his ruling and stated that he plans to keep the fishing restrictions in place, he still called upon the agency to review the environmental and socioeconomic effects of the closures as quickly as possible. In a brief filed yesterday, NMFS gave the court two potential timelines for doing so. The agency says that it could complete an environmental impact statement no earlier than June of next year, and that public participation would be somewhat limited on a timeline that rushed. NMFS is instead arguing for a timeline of 23 months. That would allow the agency to coordinate with the North Pacific Fishery Management Council and ideally release their findings in March of 2014, pending any delays. Meanwhile, the State of Alaska, a plaintiff in the lawsuit, indicated in a separate brief that it would like the statement to be completed a little bit earlier than that. It wants a timeline that would maximize involvement from stakeholders while still potentially allowing for the reopening of the Atka mackerel and Pacific cod fisheries in the western Aleutians by 2014. NMFS has estimated that the closure of these fisheries is costing the industry over $80 million a year. 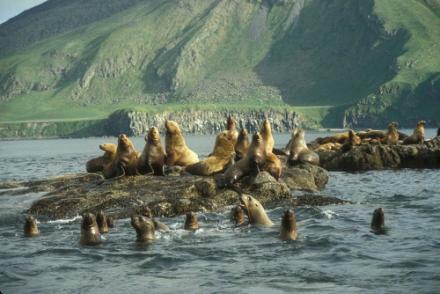 The decline of the western stock of Steller sea lions has been a source of controversy for more than two decades now. It’s now been the subject of two federal lawsuits, and tens of millions of dollars have been spent trying to figure out what is causing the population to disappear. There is still no established consensus on why that stock is shrinking, though a biological opinion released by NMFS suggests that competition from commercial fishing vessels may be affecting sea lion diet.